It seems that we should start using Matt Flynn's name as a verb for someone who unexpectedly gets their job taken by another competitor. It was fully expected that Flynn would get the starting nod in Seattle last year, but Russell Wilson came out of no where and capitalized on a combination of injury and ineffectiveness from Flynn. Wilson never looked back, and Flynn was turned into a very expensive backup. We thought that was all going to change this year, as the Seahawks traded Flynn to the Oakland Raiders, who had an opening at quarterback after shipping off Carson Palmer to the desert (Arizona Cardinals). So now, we were finally going to see what he could do after years of sitting on the bench, right? Wrong. Flynn got "Flynn'd" again and the Raiders named Terrelle Pryor the starting quarterback for their week one game in Indianapolis against Andrew Luck and the Colts. This was again due to an injury, and fairly poor play. With this, it time to set some realistic expectations for fans about what they'll see from Pryor throughout his first season. We'll start in his college days at Ohio State, where he was the star of a Buckeyes team that went 32-7 during his 3 years there. He was incredibly electrifying, and led the team to 3 consecutive appearances in BCS bowls, where they went 1-2. He was considered a Heisman candidate year in and year out, but never quite reached that level, partially because of the stiff competition from Sam Bradford, Mark Ingram, and Cam Newton, respectively. These players all had unbelievable seasons, so you can't hold it against Pryor for not being able to top any of them. He was certainly a dual-threat, and he lived up to his top prospect billing. He had some obvious faults, though, and it seemed that he relied on athleticism a bit too much. One NFL scout said, "He's a basketball player playing football." In fact, Pryor actually won a state championship in basketball while averaging 21.9 points, 10 rebounds, and 7 assists and garnered tons of interest from top basketball programs. But back to that scout's quote, that really seemed to hold true. His ability as a runner really helped him out in college, but it wasn't thought that that would be able to translate to the NFL, because teams would bring the house and make him beat them with his arm. While his career completion percentage of 60.9 doesn't seem all that bad, most of his solid passing performances were against teams like Indiana, Purdue, Youngstown State, and Eastern Michigan. When put up against stellar competition, his arm usually faltered. In 2008, he put up back-to-back games of 38.5% passing against Michigan and Texas, respectively. Those were just two of the numbers that stood out, but there were definitely more. 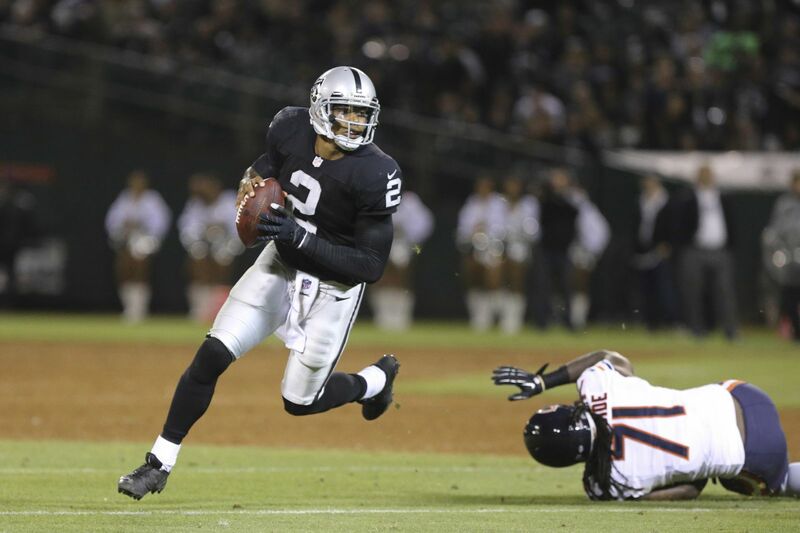 An easy way to get an idea of what kind of a quarterback he was is to just Google Image search "Terrelle Pryor" and see how many pictures you see of him throwing the ball compared to how many there are of him running. While this obviously doesn't completely condemn him as a passer, it just speaks to what his strong suit is. Pryor joined the Raiders via the NFL Supplemental Draft after being suspended in a tattoo scandal at Ohio State, and was picked with the plans of developing him over the course of a couple years. It was clear that his passing was not up to NFL-standards, but his running might have been. He averaged more yards per carry over his career than famed dual-threat QB's Michael Vick and Robert Griffin III did in college, and in his junior year, his 5.6 YPC was the same as Cam Newton's total in his Heisman-winning year. He sat the entire 2011 season, and then this past year, he finally made a few appearances. 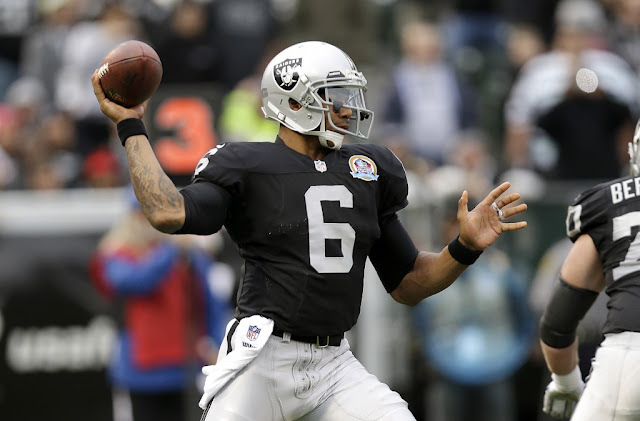 He threw a combined 2 passes in his first two games, going 1-2 with 5 yards (along with 1 carry for 2 yards and 1 catch for 22 yards) and was given the opportunity to start in the Raiders' season finale against the San Diego Chargers. This game basically reaffirmed what we already knew; he went 13-28 with 150 yards, 2 touchdowns, and 1 interception, while picking up 49 yards and a touchdown on 9 carries. This carried on to the preseason this year, as even though he totaled 131 yards and a touchdown on the ground, he was just 17-32 with 221 yards, 1 touchdown, and 2 interceptions. Those numbers, couple with a passer rating of 59 didn't really make anyone think his passing had improved all that much. That's where the difference lies between Pryor and read-option quarterbacks like RGIII and Colin Kaepernick; He is just no where near their level in terms of passing ability. He's still very inaccurate, forces throws into tight coverage, and often puts too much air under the ball. That's precisely why we shouldn't be calling him a read-option quarterback, because that implies that he's a threat as a passer. There's no doubt about it, he's a scrambler. While this will certainly provide more excitement than a pocket passer like Matt Flynn would, it just something that isn't sustainable in the NFL. As we saw with Tim Tebow, you can only run for so long before teams start making you beat them with your arm. It didn't work for Tebow, and it won't work for Pryor unless he can somehow gain some form of accuracy. He may be a solid fantasy football option just because of his running ability, but as a viable option in real football? No way. Follow Brian Rzeppa on Twitter. Damn... I wish the Raiders would trade Flynn back to the Packers. He was an amazing backup to A-Rod. As for Pryor... I'd be surprised if he shined this year. I have a bunch of Raider buddies who have very little faith in him (or Flynn). Actually... they have very little faith in the Raiders. But they're loyal to the core... which is very, very admirable. They've really been dragged through some rough years, that's for sure. They are incredibly loyal, and hopefully they'll be rewarded with a winning team at some point in the future. Given their recent drafts, though, I don't know how soon that'll be. The people in Raider Nation are my kind of fans. Hoping the Raiders get better sooner rather then later. Would love to see them regain some their old swag from the 80's back, those teams reminded me of "THE U". Pryor got almost no time with the 1st team during camp or the preseason and as such has almost no rapport with any of the receivers. He did work extensively on his own with Rod Streater during the off season and that shows as he and Streater have by far the best chemistry. He also spent the offseason working on a new throwing motion with the same mechanics coach Tom Brady uses. Everyone is ready to write the book on Pryor without giving him a chance to show us what he can do when he actually gets to play with the starters and develop as a passer. While I think there will be growing pains and some mistakes he is by far the hardest worker on the team and I wish people would give him a chance before they discount him as a one trick pony. I don't really ever buy into guys going to mechanics coaches. Sure, it's nice when you have time to think about the throw you're making, but when you have the defense rushing and you're trying to make a read, you're going to go with what's natural. Don't get me wrong, I'm not saying that this is what he's going to be for the rest of his career, I'm only looking at this year. He needs to show some real strides in the passing department to change my opinion of him. I think Pryor in due time will be a solid NFL QB just needs to adjust to the speed of the game and make sure hes always watching film. X's and o's are a huge determinng factor for a young QB's development.